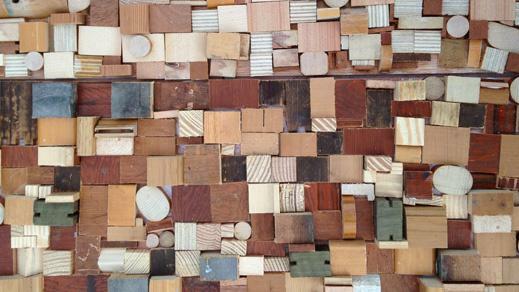 Wooden mosaics can be really beautiful to look at, whether it’s at a museum, garden or even within the home. Although there are gorgeous wooden mosaics that are timeless and found within structures around the world, you don’t have to be a sixteenth century mosaic craftsman to incorporate the beauty into your own home. 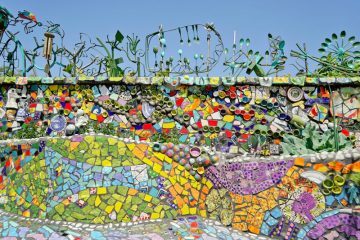 With tutorials and the right materials, you could easily create some beautiful mosaic pieces in your space. 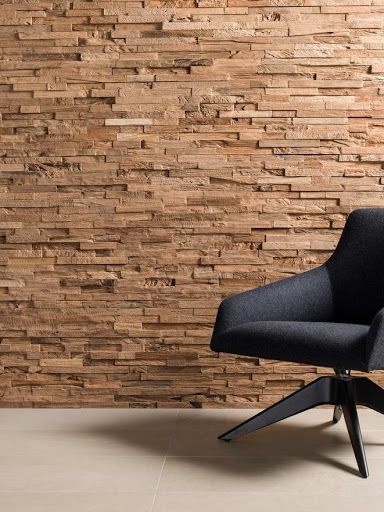 We’ve gathered up plenty of images of gorgeous wooden mosaics to get you inspired and show you just how versatile wooden mosaics can be. From larger spaces to smaller pieces of art, you just can’t go wrong with these gorgeous pieces. 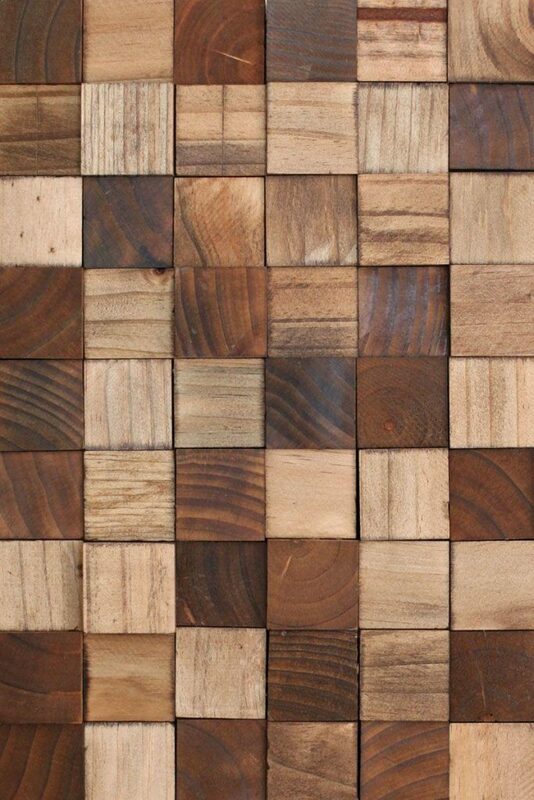 This gorgeous wooden board piece is an interesting mosaic piece since it has so much texture. The pieces of the board that are standing above the others adds a sort of depth perception to the entire piece. This would make an amazing side wall in a garden or even within a home dining room area. You could associate a piece like this to be as large or small as you need in order to fit in appropriately with withstanding décor. 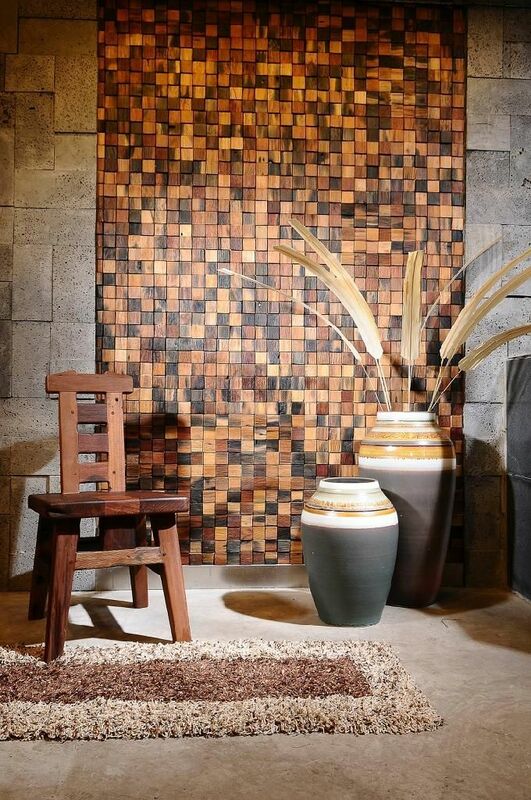 This dark and light wooden mosaic wall would make a perfect addition into your home or even in a bedroom. The difference in shades within this piece makes it amazing to look at and will surely fit in to almost any type of décor you may have. What’s great about wooden pieces is that they always look classy, no matter the setting. 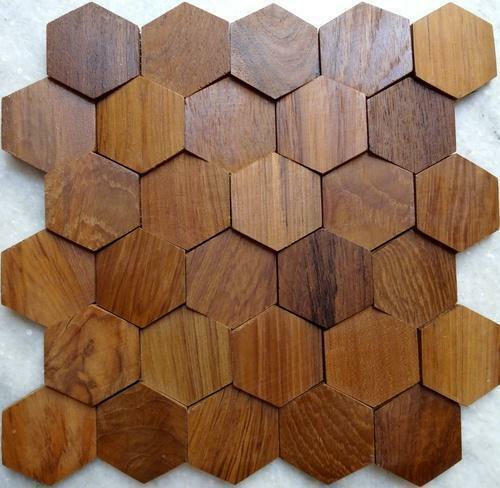 This wooden mosaic piece is comprised out of beautiful walnut shapes. 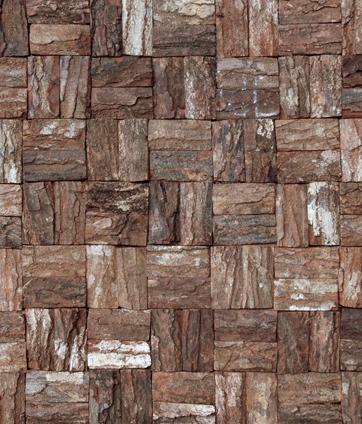 This would make a gorgeous backsplash in the kitchen or even along a hallway for some extra special paneling. Whatever you decide to use this beautiful wooden piece for, it will looks stunning in all sorts of settings and your guests will not be able to take their eyes off of it. 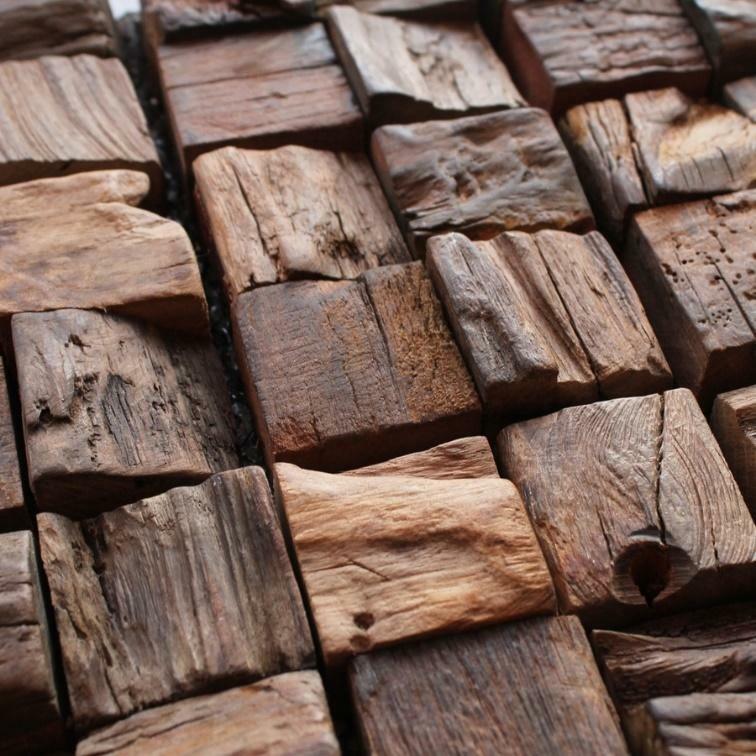 This weathered wooden mosaic piece is so interesting to look at and would look fantastic in a more rustic setting. This would especially look great within a garden setting or even in a foyer. You can easily incorporate these raw, weathered wooden pieces into a shape yourself since all you really need to do is scale out the project and follow accordingly. It’s almost like you’re creating your very own puzzle. These wooden mosaic art pieces are an example on how easy it is to create your custom piece of mosaic wooden art. They sell these varied colored wooden cubes in almost every craft store and you could easily pick up a few containers of these if you can’t acquire the wood yourself. You can customize it by creating your own design and using the varying shades to incorporate some depth. By using various shapes and sizes of wood, you can create a really interesting wooden mosaic art piece that will have as much personality as you! You don’t have to just use wooden cubes or square cut wooden pieces to create an impressive mosaic. Anything from wooden buttons, blocks, slats and other embellishments can create a gorgeous piece. You can make it as interesting and eclectic as you like. In this gorgeous piece, the same type of cut of wood is used throughout the panel, but the lines are all in different directions. 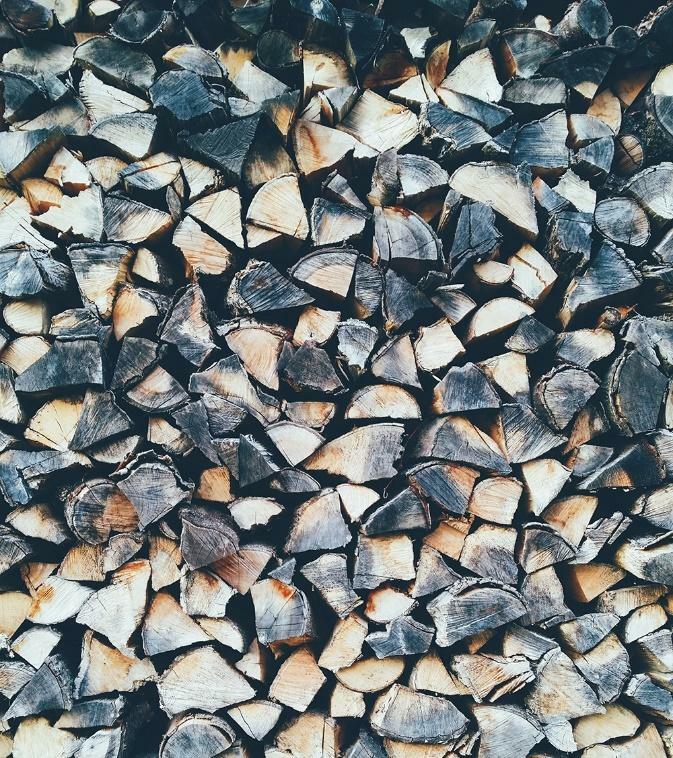 Wooden pieces naturally have that grain into them, so the wood is cut with grain lines. You can interlock or even switch up the direction of the lines in order to create some interesting patterns and textures. The shading from darker to light is also pretty cool to look at and you can do that in a degradation or interlocked, such as this piece. This ancient Japanese wooden mosaic, also referred to as Yoseki, features all kinds of colors and shapes. The yellow geometrical shapes within this wooden piece perfectly complements the marron to reddish pieces in this design, making it a gorgeous kaleidoscope of color and placement. This is a carefully planned out design that probably took a really long time to execute. This coveted art definitely won’t happen overnight, but we can appreciate these gorgeous pieces for brining so many interesting factors into the mosaic wooden art realm. 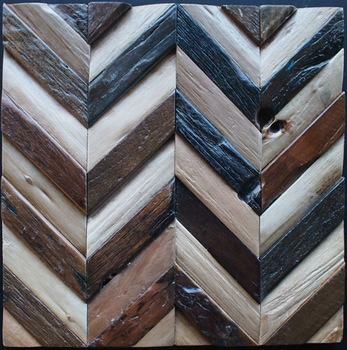 This gorgeous wooden herringbone mosaic has been carefully executed with varying slats. The colors are intermittent between light and dark and the perfect placement makes this design to aesthetically pleasing to the eye. 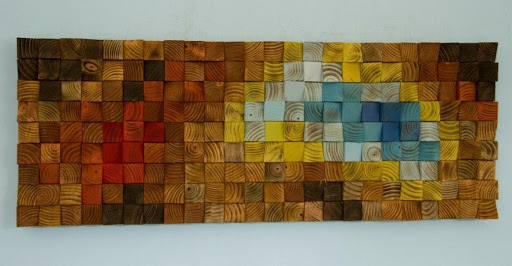 This sort of art piece would take careful planning as you’d need to make sure all of the wooden slats are the appropriate size in order to create that interlocked effect. This is an absolutely gorgeous design and will be worth the work! 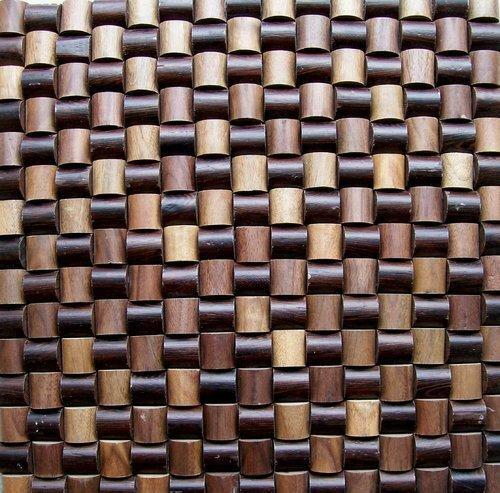 This natural wood mosaic takes up the whole wall and essentially becomes its own work of art. The interlocked pieces of wood are not uniform, but that’s what helps makes this piece feel so rustic and raw. Even the color of the wood is kept in its natural state, free from dyes or coloring that could darken the shades. This is gorgeous and would look great in an office or den setting. 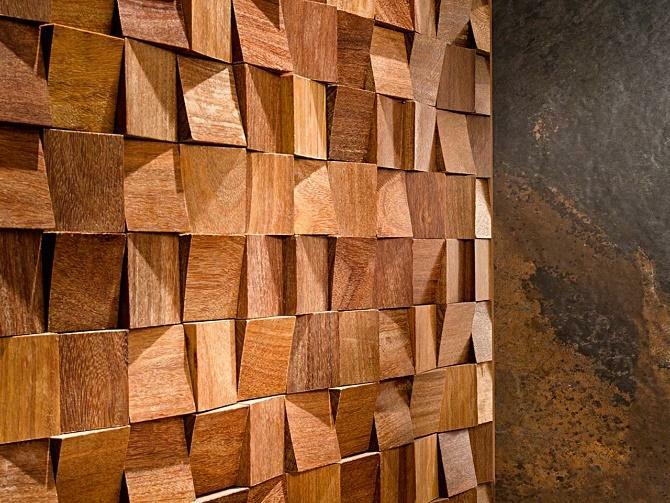 You’d need a lot of wooden pieces in order to cover a whole wall, so keep that in mind before executing this design! 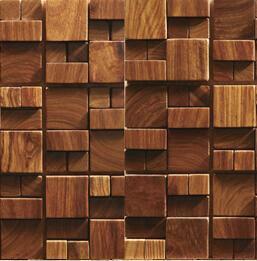 This wooden mosaic piece is comprised of many bark squares. Since wooden bark is natural and full of interesting color and textures, going with bark only makes sense! It’s gorgeously patterned and will maintain that rustic feel to it especially since its all-natural. This would make a gorgeous piece for a kitchen or even a garden wall near an outdoor sitting area. The only thing you’d have to worry about is making sure that all the pieces are the appropriate size. 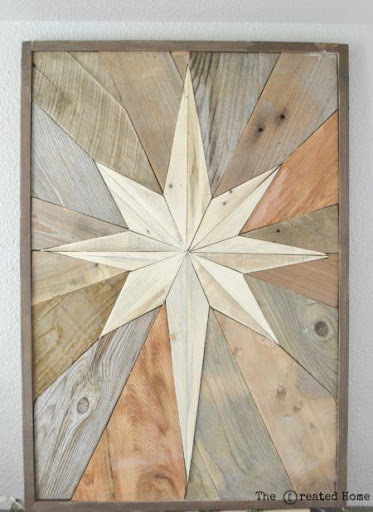 This wooden star mosaic piece is gorgeous and would make a great addition to a garden area or even a kitchen. This would look best in a setting that has other natural wooden attributes, but it’s so gorgeous it would even look super great as a standalone. Whatever you decide to do with a piece like this one, you will definitely not regret it due to its intricate shape and gorgeous coloring. 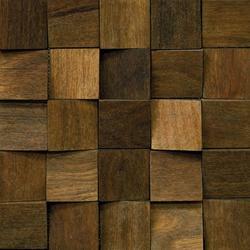 These irregular wooden tiles are so intricate in color and texture. 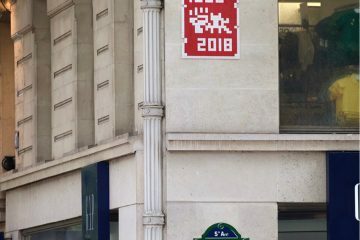 They are each so interesting on their own, but when placed together, such as this mosaic depicts, the outcome is absolutely breathtaking. This would make a fantastic wall mosaic and, though it would be a lot of work, it would really pay off considering how wonderful it all looks when completed. 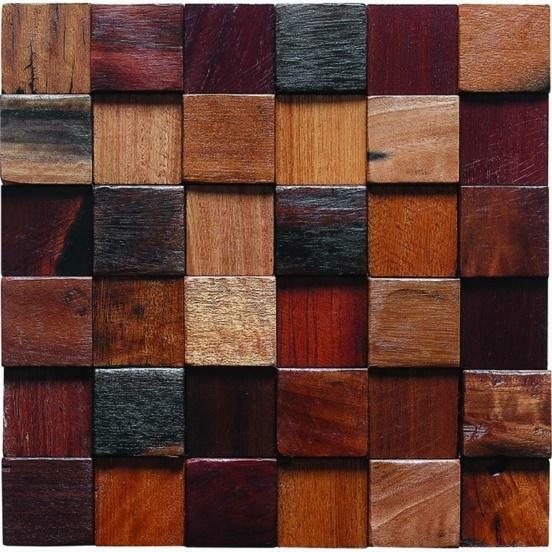 You can use all kinds of colors, sizes and shapes when it comes to using irregular wooden tiles like these. 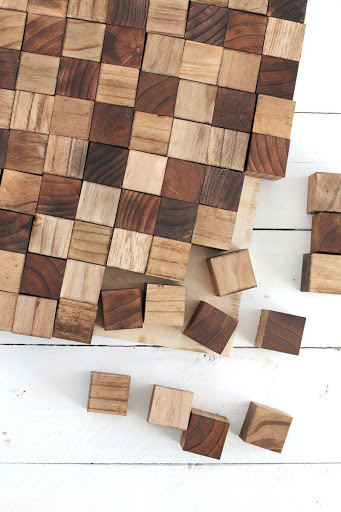 These 3-D cut wooden tiles are super great to look at and make for an even greater mosaic piece on a larger scale. The shadows that these 3-D pieces cast add to the texture of the whole thing. This type of piece would need some lights on it to be able to appropriately cast those really fantastic shadows. This would make a great art piece to have in a den or sitting area where everyone can enjoy it. These wooden pieces appear to have some scorching to them. This makes a really interesting pattern and provides so much depth in color and texture. This would look great along a garden wall in an outdoor barbecue area or even in a den area that gets a lot of sun so that you can see all the scorched grain and texture. The cut itself is also interesting since it’s more of a thinner, longer cut than the typical wooden squares we’ve seen before. This wooden mosaic wall piece is the perfect backdrop for all these interesting artifacts. This looks like a scene out of a small home, but could even be a display within a museum to show how stunning the mosaic artwork during a given time period was. This is a great way to add some depth into a space and use it as a proper back drop for all kinds of interesting décor. This roughly cut mosaic piece features some of that fantastic 3-D cut that we’ve seen in a similar image. This cut is a bit more subdued, but the colors vary from light to dark within this piece, creating an interesting effect and causing more shadows to fall on the actual piece itself. This is a stunning piece of art that would look wonderful in a dining room or a sitting area. The more irregular the cut of wood, the more opportunity for color degradation and shadowing. 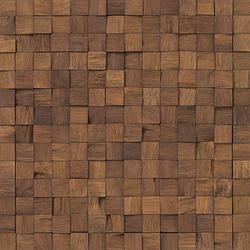 This molded wooden mosaic is truly original and exceptional in design. The high gloss cut of this wood makes the shapes shine out in pegs and squares. The intermittent color of the wood, varying from rich dark wood to the lighter, more natural color of wood, makes this piece even more intricate and fascinating to look at. This would make a great wall piece in a swanky museum office or even in a study room or hall. You can potentially do so much with a piece like this and scale it to the size you need it to be. This reclaimed wooden art piece is just stunning to look at. Almost in the structure and placement to resemble a geode, a natural colorful crystal found in nature, this piece is set up just perfectly to capture the imagination. 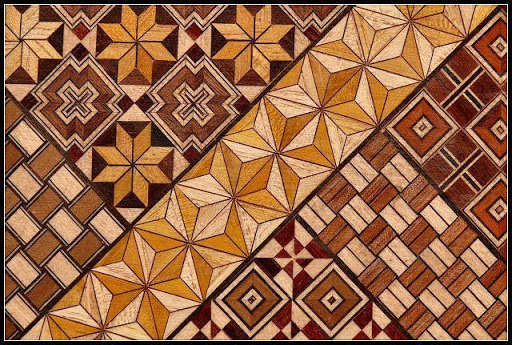 The wooden cuts are natural and maintain the grain lines, but the colors are either incorporated from dye or actual paint. Whatever they used to create this mural, it’s totally working because this piece is so gorgeous to look at. Create your own art piece using this kind of structure and color options. This woodshop mosaic art piece is comprised of so many different shapes, colors and textures that it’s basically an art piece within an art piece. 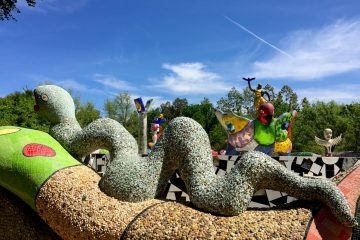 You can create your own artistic landscape, such as this one with the boat and sun, by using this kind of idea. Whether you need a large piece or a smaller one, you would need to scale up or down depending on the preference. This would definitely take some time, so, thankfully there are gorgeous pieces out there pre-done so you don’t have to worry about getting too creative if you don’t have the time for it! So, as you can see, there are so many gorgeous mosaic wooden art pieces out there. 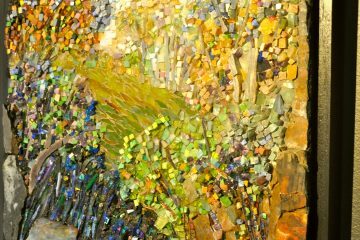 You can either create your own art piece or use several mosaic pieces to create a whole wooden mosaic wall. There are also manufacturers who create these types of spaces for you, kind of like how manufacturers place marble or tile, so if you don’t have time to create your own, you can have these professionally done. Whatever you decide, these are all stunning and are sure to look super great within your living space! Do you have any experience working with wooden mosaics? Please feel free to share your options or insights within the comments so we can all get some new, fresh perspective on wooden mosaics.